“The Life of Jesus Christ.” The more you know about the life and character of the Man, Jesus Christ, the greater your love and loyalty will be for Him. – Come and discover the life of Jesus that prepared and qualified Him to be all that He is: The Savior of The World! 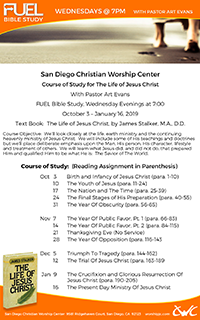 Immensely illuminating, this study will enrich your faith and deepen your desire to know the Son of Man.” You do not have to have the book to enjoy this study. Come join us this Wednesday!